Philosophical Perspectives on Play builds on the disciplinary and paradigmatic bridges constructed between the study of philosophy and play in The Philosophy of Play (Routledge, 2013) to develop a richer understanding of the concept and nature of play and its relation to human life and value. Made up of contributions from leading international thinkers and inviting readers to explore the presumptions often attached to play and playfulness, the book considers ways that play in ‘virtual’ and ‘real’ worlds can inform understandings of each, critiquing established norms and encouraging scepticism about the practice and experience of play. Organised around four central themes -- play(ing) at the limits, aesthetics, metaphysics/ontology and ethics -- the book extends and challenges notions of play by drawing on issues emerging in sport, gaming, literature, space and art, with specific attention paid to disruption and danger. It is intended to provide scholars and practitioners working in the spheres of play, education, games, sport and related subjects with a deeper understanding of philosophical thought and to open dialogue across these disciplines. Malcolm MacLean studied anthropology and history with a PhD from the University of Queensland, Australia, and is Reader in the Culture and History of Sport and Associate Dean, Quality and Standards at the University of Gloucestershire, UK. He has taught history in New Zealand and worked as a policy analyst and historian in the New Zealand Ministry of Justice. His publications deal with cultural boycotts and sports-related anti-apartheid protests, the cultural politics of settlement colonies, and discourses of indigeneity associated with sport, body, and movement cultures. He is actively involved in international sports studies networks and was Chair of the British Society of Sports History. He is an editor and author of Philosophy of Play (Routledge, 2013), ‘Sporting nations without states’ (2014) and ‘The sports club in history: International aspects’ (2013). Wendy Russell is a Senior Lecturer in Play and Playwork at University of Gloucestershire, UK and a consultant on children’s play and playwork. She has worked in the UK playwork sector for over 35 years, first as a playworker on adventure playgrounds, then in play development, research, and education and training. She has worked on development, strategic, evaluation and research projects for local authorities, the private sector and local, national and international voluntary organisations. Key publications include, co-authored with Stuart Lester, Play for a Change (2008) and Children's Right to Play (2010). 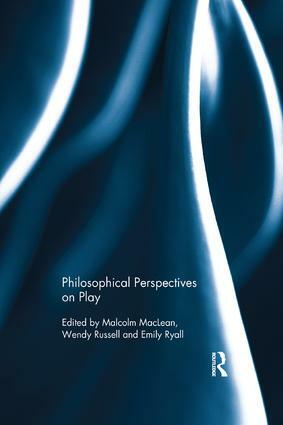 She co-edited The Philosophy of Play (Routledge, 2013) with Emily Ryall and Malcolm MacLean. She is on the editorial board of the International Journal of Play.